Is the Clinton campaign serious about Missouri? I stopped by the brand new Hillary Clinton campaign HQ in St. Louis yesterday. It’s a small-ish storefront on a busy street in the city, at 4039 Lindell Blvd. It’s currently staffed by two enthusiastic college students, who are equipped with laptops, a couple of folding tables, and a few chairs. It’s just the beginning: there are no phones, no wi-fi. The storefront windows are festooned with Hillary posters. I’m told there is, in fact, a state campaign director on board, but she was at lunch when I wandered by. And a grand opening is set for August 23. All of this is encouraging news. I hope the now-empty office morphs—quickly—into a crowded place, filled with volunteers doing data entry, making phone calls, and marching out into the streets to get out the vote in November. I’ll be one of them, and I’m going to recruit as many other people as I can. Hillary is one of the most qualified candidates for President we’ve seen in many years, and she deserves to be the first woman elected to the Oval Office. I just hope that the powers that be in her campaign, and in the Democratic party, are serious about campaigning in Missouri. The young women staffing the folding table at HQ yesterday said that this was going to be the only office in Missouri. They thought that the campaign’s thinking is that Kansas City didn’t need an office, because “it has a very strong group of volunteers.” I hope they’re wrong, and that the campaign is thinking bigger than that. Pollsters and pundits [whose opinions I take with a large grain of primordial Himalayan salt—unless they agree with my own leanings, of course] are calling Missouri a “lean-Republican” state. That’s a big change from the deep-red designation we’ve had for the past decade. That means that Hillary has a chance here. It also reflects the tightening race between entrenched Republican Senator Roy Blunt and Democratic challenger Jason Kander. But maybe there’s a chance this year, and it would be a shame to miss the opportunity. Undoubtedly, there are a lot of Trumpians in Missouri. But if Trump continues to demonstrate his complete lack of competence and fitness for the Presidency, and if Republicans stay home [or even—gasp—vote for Hillary] we might just get a win for Hillary—and for Jason Kander, who would be a linchpin in wresting control of the US Senate from the Republican stranglehold. 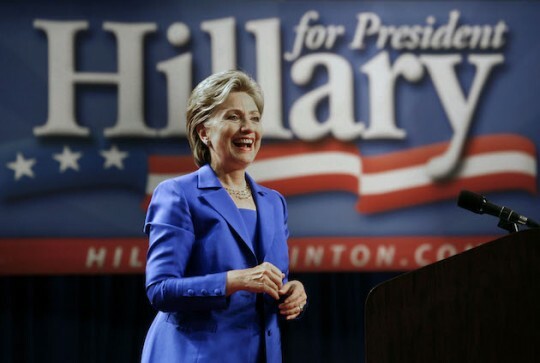 So, is Hillary’s campaign opening a Missouri office just for show? Or are they going to put out a real effort in a 50-state campaign? A serious push by the top-of-the-ticket campaign could boost Jason Kander’s chances. Bailing out later in the campaign [which is what happened with the Kerry campaign in 2004] would be dispiriting for Democratic candidates and would probably hurt turnout. I hope they do the right thing. Next Post:Hillary, I’m trying to help. Give me something to work with.